I was lucky during my pregnancy in that, for the most part, people didn’t view my large belly as an open invitation to give me their birth horror stories or outdated advice. I’ve heard stories about rude comments from strangers, but I never experienced that, although I did notice people not-so-subtly gaping at my girth. 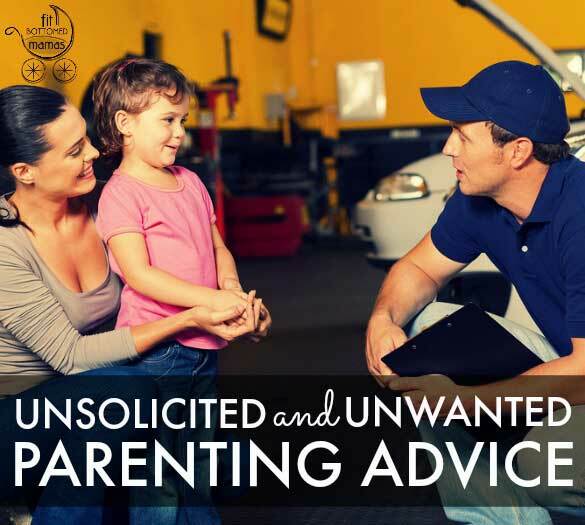 Since my daughter arrived, I’ve gotten unsolicited advice a couple of times from strangers. Once, when leaving a restaurant, I was loading a crying, hungry baby into her infant car seat. I was trying to focus on getting her properly restrained under pressure when a woman stopped on her way out the door. “She has gas,” she declared expertly before giving me step-by-step instructions on what I needed to do and exactly how I needed to do it to relieve the “gas.” I was so flabbergasted and preoccupied that I couldn’t even respond to the know-it-all that actually, it had been a few hours since she’d last eaten and she was getting hungry. Cut to yesterday. I desperately wanted a cup of coffee and had no creamer on hand. So I packed Avery up in her Ergo baby carrier and headed to our corner store. Now, I have worn Avery on my chest numerous times in the carrier, but had only carried her once before on my back. After several minutes of acrobatics that could get me a spot in a circus sideshow, I got her adjusted, straps tightened. I checked her out in the mirror to make sure she looked comfortable and headed out the door. One random person commenting? Could be a fluke. Two people questioning me in one day? I figured something must be wrong that I couldn’t see, so I walked home quick-fast-in-a-hurry and did a mirror check. All was fine; baby was still happy as a clam. But I was bummed out, feeling like I’d been a bad parent. I of course want to do what’s best for my baby, which is why I went to great lengths to make sure she was comfortable (even holding up a hand mirror at the pharmacy to check on her). Had she been fussing or squirming, I wouldn’t have played the I’m-right/mom-martyr game; I would have adjusted her so she’d be comfortable. So, who knows. Maybe Avery had on her “I’m about to poop” face; maybe these women had never seen a baby carrier before; maybe they just wanted to be nosy. Whatever the reason for the two-banger Tuesday, I’m going to try not to let it make me super paranoid the next time out. Or let it make me feel like my mommy skills are lacking because, after all, everyone’s parenting style is different and aren’t we all just doing the best we can? Don’t let it get you down, there is ALWAYS going to be someone that has to tell you how it’s “supposed” to be done. You know your baby, they don’t. So glad you didn’t get the birthing horror stories. I went to a friend’s birthday party (30 years old) and got some of the worst. I am due at the end of April and wondered what would possess someone to share those types of stories with a woman who was a bout to give birth. Seriously?! As for unsolicited stuffs, I had a complete stranger come up to me and touch my belly a few months ago asking when I was due. I wish I could bold the “complete stranger” part because I had no clue who the lady was. I looked her in the eye and asked her if she would like me to grab or touch her breasts because what she was doing to my belly was just as inappropriate. She apologized profusely and went about her shopping at the store. My canned response in these situations was, “Weird, that’s not what she told me.” Please feel free to use it. Another favorite was, “Oh, thank you, Dr. Spock!” as I go about my business. Stories from others are just par for the course. The unsolicited advice though, that drove my wife and I nuts. Baby looks perfectly happy back there. Once I was out with my daughter a little too close to naptime and she started to cry. As I was carrying her out of the store (sans purchases, mind you) a woman BLOCKED my path to berate me for not caring for her properly. Luckily, MY mom was along and took care of it, but I wanted to cry. Later, I just chalked it up to that lady’s lack of boundaries. BTW, my children both preferred being in their carriers to any type of stroller, cart, etc. I had to go to Walmart while on vacation, because somehow we had lost all my sons binkies and he sip cup broke and mommy brain me forgot to pack the umbrella stroller. My son was throwing a massive fits and he was also tired. He was in the cart laying down just screaming and I just decided ignore him strategy grab and go as quick as you could was best because, there was no taking to a 18 month old sleep deprived and angry. I noticed some lady following through the aisles back to the bath area and when I stopped to grab stuff off the shelves he just hover an aisle over staring at me. Ignore her until she kept following me not doing any shopping of her own. I finally stopped in the middle of aisle turned around and ask what her problem was. She said “I don’t like how you’re treating your child that abuse you know”. I was like WHAAAAT in my head. I told her she was out of line and needed to leave me alone and stop following me and I started to walk away. She continued to following me and saying I was horrible parent for ignoring my child and letting him scream and kick in a shopping cart which to her was child abuse. I finally couldn’t take her yelling at me a snapped and yell back which caught the attention of everyone around us. This is where this whole experience got so much better. Those people around us were other moms who one themselves had a kid out in the car doing the same thing my son was doing. Two moms step in between me and the lady harassing me they told her if he didn’t back off and leave me alone they were going to call the police. The lady finally walked away and I was just dumbstruck with everything that happened. Those moms though saved me and assured me I was doing nothing wrong and one of them even stayed with me to calm me down and he with my son and then walk with to the checkout to make sure they rude women didn’t return. By the time I got through check out and to the car my son was sleep and the whole situation had me drained. I was just so thankful those other moms step in and helped me not many people do that and as a single mom they don’t know how much that meant to me that they did that for me.